A few weeks ago I wrote about Institut Esthederm’s eye patches – you can see the review HERE. 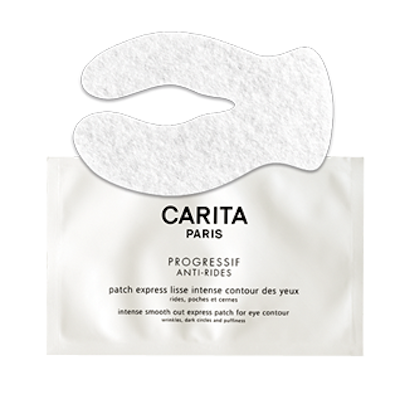 Since then I have gone a bit Eye Patch Crazy and the latest to have been gracing my face are Carita’s Intense Smooth Out Express Patches for the eye contour. These differ slightly from the Esthederm in that they treat both the upper and lower eye area at the same time. Slightly trickier to keep on if you’re making toast and answering the door to the postman (yes, that happened) but much quicker and convenient if you have five minutes to spare. Just lie back on the bed with the patches on and try not to fall asleep! The patches have an RRP of £39 but are £34.20 with free delivery at FeelUnique. You get ten patches, but each patch only treats one eye, so really you’re looking at about £7 per use. Unless, of course, you use one patch and then swap it to the other eye after five minutes…but that kind of defeats the point of a relaxing eye treat! They work out slightly more expensive that the Esthederm patches, but they do treat a bigger area and I think that this ‘hit it in one go’ approach is actually very effective because the entire eye contour is stimulated and revitalised. You could use these patches as an occasional treat, an emergency rescue, or as part of a regular anti-aging regime. I’m opting for emergency rescue, but that seems to be quite often at the moment! I have been doing 50-hour weeks at the computer, manning Mission Control and creating new and exciting things. Have you stopped by at The Forum yet? It really is delightful – like having a little coffee-shop inside your computer! Carita Intense Smooth Out Express Eye Patches are £34.20 delivered from FeelUnique HERE. Previous Post Welcome to The Forum!